One New Aftermarket Replacement John Deere Radiator that fits Tractor models: 2510, and 2520. Also fits Stationary Engines with JD Engine Models: 4276D without Turbo, and 4219DF. Overall Height: 26 7/8" Overall Width: 18 7/8" Core Height: 20 1/16" Core Width: 18 1/4" Depth: 2 1/4" Rows: 3 Fins Per Inch: 10 Fill Neck Height: 1" Inlet: 1 1/2" Outlet: 1 7/8". Only the 48 contiguous States in the U. 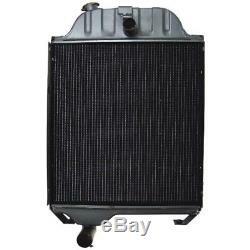 The item "Radiator for John Deere Tractor 2510 2520 AR38551 with 4219DF 4276D Engines" is in sale since Friday, February 10, 2012.